At only 23 years old, NICK WRIGHT has posted 781 videos on his incredibly popular YouTube channnel to date. His videos have been watched over three millions times. The powerlifter and former bodybuilder has created an amazing life in which he inspires people all over the world, documents his journey both inside and outside of the gym in videos, and travels all over the United States proudly representing the iSatori supplement brand. The articulate, passionate, and confident fitness authority cares about his followers–and it comes through in every word that he speaks. During this podcast, Nick Wright offers some awesome advice about following your passion in life and successfully selling yourself and your ideas to others. He discusses how to present your accomplishments in the most empowering ways–that are still always 100 percent accurate at the same time. Nick also shares the strategies that believes led to his massive following and the movement he is leading. He talks about how he went out and sold himself with confidence, determination, and respect to companies asking for sponsorship. “You want this!” is the attitude he embraced while doing so and that help produce his opportunities. Wright talks about his childhood growing up and the “hustler” business mentality he had from a very young age. He reflects back on his competitive bodybuilding career and the achievements he earned in the process. 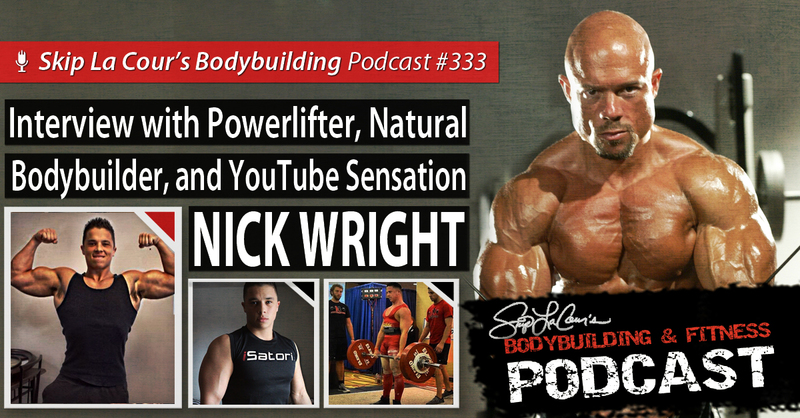 The YouTube sensation also talks about his powerlifting career, his future business plans, some of the goals he has set for the rest of his life, and much more.